The future is coming faster than you think? Welcome, dear Reader to my ‘Start of Half-Term’ blog. Since last I wrote, some 1500 adults and children have attended our annual fireworks event, held at CCJB up at Maidenhead Thicket, managed to spend over £11,000 thus assisting our PTA raise funds for their many and various causes. It seems this event races around each year, and I can’t actually believe we have already booked Messrs Firework, Electrician and the food already for next year! Time fairly races by. When I was young, and when I recollect about my youth, the days were indeed long and I know I had to learn much about boredom. My parents spoke about such things as well; ‘Children are seen and not heard’ my mother would say, sending us scurrying for cover because, of course, we had long since learned that if we pressed our parents patience, to bed we would go, even if it was still daylight and not (in our view) bedtime. And not just that ‘don’t go interrupting parents’ regime was instilled in us. Education and Family life seemed 2 sides of the same coin, with a very good deal of overlap. The parish priest was in my primary school often enough to know that we knew him. Absence one Sunday was followed by a chivvy up of “where were you?” the next. Learning to serve as an altar boy developed manners to the n’th degree; after the host had been consecrated, how could I, he i/c wine and water cruets, subtly hold up the tray of condiments without being either too early or too late. And oddly, I don’t remember any of our generation not knowing how to mind our ‘P’s and ‘Q’s, one of those quaint phrases lost in the midst of time. Whilst it might be attributable to the barman watching their customers navigate through pints and quarts, I prefer the literary suggestion that in the early days of printing, and given their mirror image status, I prefer the concept that the printer’s apprentice would be asked to mind these in the lower case setting, because they look so similar. In short, we were wary of parents and other adults in charge, and they seemed to know that we were likely to be up to mischief. So, late October 2014, and what do I make of our next generation cohort, as they (some 1,005 in number) break for a well deserved few days of Rest and Recuperation, though lots has run to plan. From top to bottom, when and where we have won is because our children and their teachers have played the comedy of manners to perfection. Ablaze with current pedagogy, good technology, staffing in depth and obvious parental support, I’d have to confirm the first 6 weeks have gone really well, and the signs are good for the 2015 cohort, whatever their age. Yes there are some issues that have emerged that we are having to ‘scrub up’, and given our pathological hatred of the concept of ‘complacency’, there is an advantage to the customer/consumer that we grow more self-critical each year. 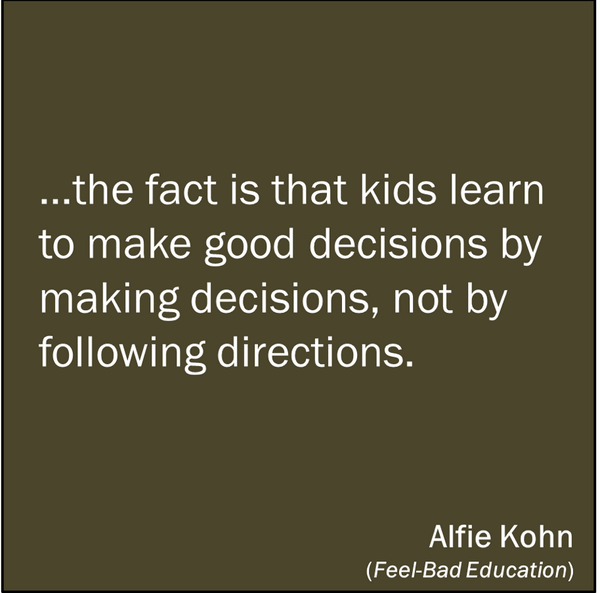 I am a great fan of Alfie Kohn, parent, author and educationalist. The graphic at the side highlights one of his key beliefs, which rather fits into my story starter for 10. More generally I do fear for the nation, because their advisors seem to have lost all contact with the continuum that brings cohorts in school through to a sensible conclusion. With every aspect of the state’s provision now up for review, from A-level down through GCSE and the Key stages, the only thing that’s certain is uncertainty. And in that uncertainty, those that direct our thinking, such as DfE and Ofsted, continue to set out their stall. Now, if you have time, have a watch of this video that suggest the best of what can be achieved at Nursery level, released by Ofsted last year. It makes most experienced educationalist blood run cold, because throughout the film the teacher is in charge of the narrative. Not only do the children all get to wear the policeman’s hat, but the teacher appears to insist on putting the hat on! What is chilling about the debriefing at the end is the sage affirming that the teacher did really well to ensure that each child picked the animal the teacher wanted them to. So in this liberal, informed, exciting educational environment, we set out our stall at every level to show children that they have choices and challenges to face, and the best learning happens when they rise to all that they face. In the alternative world of ‘teacher knows best’, a frightening future in which children’s interested are ‘sidelined’ by the teacher’s strident certainty that ‘objectives need to be met. As a fellow blogger, author and highly respected commentator, Sue Cowley writes “I’m sorry, Ofsted, but you cannot just stick a police hat on a child, set all the rules of the game, tell the children exactly what to do, and then call it ‘play’. Play is messy, joyful, creative, child led, imaginative, risky. It is about defining yourself, your relationship to your peers, and to the world in which you live. It is a fundamental part of the way in which young children develop. And children tend to laugh a lot when they are doing it. Therefore, I conclude that these videos are not an example of ‘learning through play’. They are a demonstration of ‘direct instruction for tiny children”. At any level in school, learning is messy, and the higher the level of learning, the messier it gets. Well that’s our view, those that feel as teachers and school leaders, we know our pedagogy. And the joy of such learning is that it is much more fulfilling, because above all it does not demand pace above substance. All the best learning is characterised by the paradox of pace, sometimes quick, and sometimes slow and often uneven. We have our duty to ensure the children get through all they need in an academic year, and we exercise that duty best if the opportunity to explore is made available as each and every child sets out on their next educational stage with their new teachers at the start of the new term. As those in our new Year 12s have made clear, it is a huge step up after GCSE, sentiments shared by those commencing their GCSE and their new Year 7. The epithet of the moment might indeed be ‘The future is coming faster than you think’ and it is so obviously our duty not to get caught up in the rhetoric but to keep our eyes on the main prize, because ‘steady as she goes’ does make for the best learning in the long term. This entry was posted in Uncategorized and tagged children, GCSE, teacher. Bookmark the permalink.